Pools, fountains, streams, ponds, waterfalls—whatever kind of water features you envision for your Phoenix home or commercial property, Desert Environments can bring those ideas to life. Create a beautiful and timeless oasis in your own front, back, or side yard. The customization options are countless. Our expert landscapers take pride in the work they do, and it shows. We consider landscaping to be a work of art in which every detail matters and must be done with care and precision. When it comes to the art of custom water features designed to complete the ambiance of an outdoor environment, no average Joe landscaper will do. Our professional landscapers are well-versed in the knowledge and process of incorporating water into your new or existing landscape. Rely on us to do the job right and bring natural beauty to your home that will last for years to come. If big, bold, and elegant is what you seek, we can craft a gorgeous centerpiece fountain. For something a bit more subtle, homeowners often opt for natural-looking streams as an accent to their landscape. From start to finish, design to installation, Desert Environments specializes in customizing water features to our customers’ needs and requests. Choose from a wide range of options or come up with your own. We promise to do our utmost best to make it happen. Check out our portfolio to see some of the work we've done. Measurements and proportion: We promote designing for your landscape. We’ll assess the area and present you with multiple configurations and options that work with the flow of your property. Speed of the moving water: Most of what makes a water feature attractive is the flow and movement, which can be tailored to your preferences. Would you prefer a slow, calming flow, or a faster, more energized motion? Volume of the moving water: Tying in with speed as mentioned above, the volume of your fountain, waterfall, or stream affects the overall ambiance of the landscape. Are you opting for a soft stream or a louder gurgle? We can tune the sound to a higher or lower decibel by adjusting the water level, speed, and pressure. Spillway appearance: These control the flow of water and are an integral element in continual fountains and waterfalls. As space allows, our specialists can craft a spillway that is larger or smaller, straight or winding. 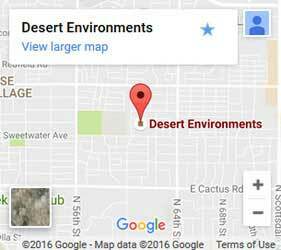 Dry appearance: Especially in our dry Phoenix climate, you won’t always want to have your water running. But that’s no problem. We’ll ensure that your water feature is aesthetically pleasing even when it’s dry. Call Your Phoenix Landscaping Contractor Today! Contact us today for advice and answers to any of your questions. Call us or visit our Phoenix office. 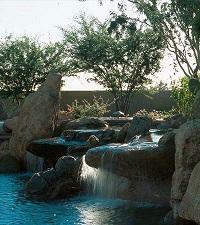 Let us help you acquire the gorgeous, natural looking water features you’ve always wanted!